We hope this FAQ answers your questions about our membership. If you want to learn more about who is behind Smart Insights and how we can help your business, see our About Smart Insights page. If you have any other questions, do contact us. You need to be registered and signed-in to access these using the sign-in link at the top right of the site. Q. Which premium member resources are recommended for new members? 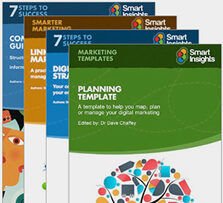 Smart Insights premium membership provides you with a comprehensive set of templates, guides and e-learning in 10 toolkits designed to help you improve your personal knowledge of digital marketing and improve the results your business gets from digital. The best place for you to start will naturally depend on your personal knowledge, your role and the size and type of your business. This Getting Started guide starts with four of the most common needs of our members and then provides a detailed schedule of activities based on the Smart Insights RACE Planning that you need to work on to make a planned improvement to your business. Q. How do I get year-round access to all your resources for different team members in our company? Business membership gives your business a complete system of audits, templates, guides and e-learning to help you rapidly review your digital marketing, improve and drive growth - fast. It includes resources in 10 exclusive toolkits only available to business members. Learn more about discounted rates for Business membership which gives personal access for each person on a team to access resources and check off different units of the courses and resources they use. Q. What is the difference between Annual and monthly Individual plans? The Annual Individual plan is the best value since as well as 'all you can eat' access there is also a discount making it cheaper per month - compare membership plans and pricing. The Monthly Individual plan is paid for each month, but there is a restriction to a maximum of 5 downloads per month. If you don't use the 5 downloads each month we will 'rollover' unused download credits to the next month up to a maximum of 50 credits across the year. So if, for example, you only use 3 of your 5 downloads in July, you will be able to rollover a credit of 2 downloads into August, giving you up to 7 downloads in August and so on. When your membership expires you permanently lose all unused credits remaining in your account. In common with other subscription services and as explained on the payment form, both plans are recurring subscriptions, so you will be billed automatically at the end of each period. Should you wish to cancel, just hover over your member name in the blue bar when logged in, choose My Billing Details and then you can cancel from the bottom of the page. We want to support students as they're the next generation of digital marketers and we recognise that the cost of course fees. So we offer a substantial student discount for full-time students who can provide proof of their education institution. Please contact us for our student rate. Q. Can I stop my subscription part way through my billing period? Yes, you can cancel your premium membership plan at any time via the View Profile option (Top Right) when signed in - you will retain premium membership until your current billing monthly or annual period expires, and it then won't renew automatically. Q. How secure are your payments? We use industry standard 2048 bit secure encryption for transactions - shown by the secure HTTPS padlock in the browser bar. All payments are through PayPal - we don't store your details. You don't need to register with PayPal if you pay by credit card. Q. How can I print an invoice as proof of purchase for Accounting purposes? When you first pay or renew a receipt is sent to you by Email from Paypal, our payment processing service. Members can also print an invoice for accounting purposes from the View Profile > Purchases and Receipts page when signed into the site. This option is only available to members who joined recently, otherwise, please contact us forwarding your original joining date, amount and address to show and we will create an invoice for you. Q. I have a problem with payment? Q. Can I pay with American Express Cards (AMEX)? To pay with your American Express card you must select the payment by Paypal option. "The error code in question refers specifically to a billing address mismatch. If the billing address does not match the address where the card statement is sent the transaction may be declined by PayPal. This is often caused by a recent move where the address on file has not been properly updated. There is a possibility that the card is linked to your PayPal account (if you have one) with a different address and PayPal is using that instead of the billing address you entered. Please note that it is not necessary to have a PayPal account to pay with a credit card and the message refers to the PayPal credit card payment gateway". Q. Which countries do you support for membership payments? We use Paypal for processing credit card payments, so payment can be made from the countries Paypal supports. However, some countries aren't supported. Here's Paypal's list of supported countries. Q. Can I change the frequency of my email? Our Enewsletter is aimed at giving busy marketers a twice-weekly summary when they don't have time to scan the blogs or social streams every day. However, we have had some requests for more frequent emails. If you want to obtain these you can through registering with our feed which is on Google Feedburner, so we recommend as a trusted service. You have to be signed in to download resources using the green "Download" button on the left of the resource page. If you don't see this it could be due a caching problem of the page with your browser. It's very rare, but if you do experience this, the solution is is to use a "hard refresh" when you're on the document page. Your user name is the email you entered when you signed up. Your password is automatically generated and sent to you by email. You can find out your password from the email we sent to you when you joined. Alternatively, choose the "lost password" link from the Sign In page. Our privacy statements and forms have been reviewed by a specialist data protection lawyer and comply with the emerging European standards of GDPR and the ePrivacy initiative. No, we don't rent lists, so your personal data is safe with us. Q. How do I opt-out? To unsubscribe from our enewsletter or promotional emails, follow the unsubscribe link on the email. For other privacy questions, see our detailed Privacy statement.